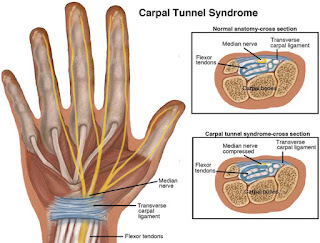 Carpal tunnel syndrome is an often painful condition associated with numerous symptoms affecting the hands and wrists. This impairing condition results when the median nerve, housed within the carpal tunnel of the wrist alongside other tendons in the hand, becomes compressed. The role of the median nerve is to control nerve sensations and impulses from the palm area of the fingers and the thumb as well as to the muscles in the hand, allowing feeling and movement. 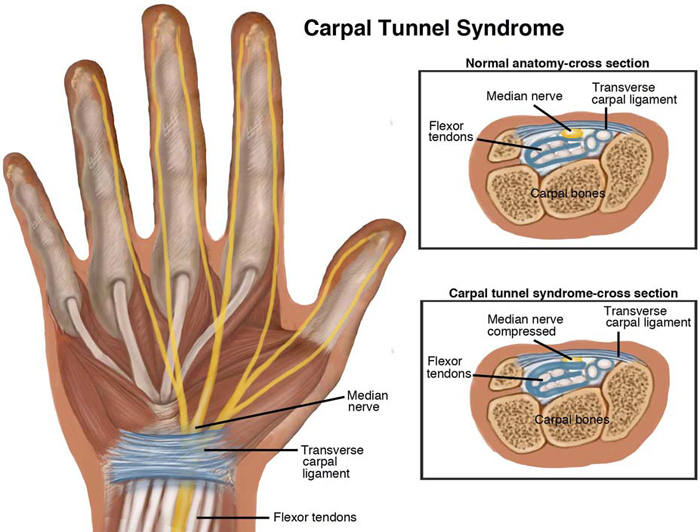 When the tendons become irritated, causing inflammation and swelling, an impingement of the median nerve occurs, resulting in carpal tunnel syndrome. The compressed median nerve may suffer a variety of symptoms which are frequently associated to the condition. Trauma from an injury to the hand or wrist and/or repetitive activities resulting in overuse, such as constant typing on a keyboard, are common ways carpal tunnel syndrome develops. The extreme pressure on the wrist begins to irritate and compress the median nerve, leading to the debilitating symptoms of pain, among others. The most common symptoms for carpal tunnel syndrome include pain, numbness, tingling sensations, and weakness on the hand, wrist, and forearm along with the surrounding muscles. Pain and numbness in these areas is usually intense. The discomfort from these symptoms can affect an individual’s everyday lifestyles. Gripping objects may become difficult as carpal tunnel syndrome progresses over time due to loss of muscle strength. The tingling sensations radiating from the hand are often described as a feeling of “pins and needles” through the hands, wrists, and forearms.